Most of the presents are beside the small Christmas tree, although now as I survey the room I see that one of Santa’s elves still has some gift wrapping to do. I love the snowman. This year we offered the studio early in December as the venue for a holiday party for some high school classmates. That was fun. Kaaawa is considered a “far” drive from anywhere else on Oahu. We started at 3 in the afternoon and folks could enjoy the scenery on the way to our place, as well as find their way in the daylight. Mood set and home decorated, we mailed Hawaiian cards to friends and packages to family far away. Wreaths were a success again (see previous post). My friend Kiana whose ministry is feeding houseless people (i.e., they don’t have kitchens or money for good food) planned a holiday meal for 200 and asked for help. Normally she does most of the food prep herself. I offered to bake some pies and managed eight of them. To donate those desserts was very satisfying to me. Can you understand? Yesterday I baked a batch of “magic cookie bars” and divided it among our immediate neighbors. Later at a gathering Quinn, so cute, asked what they were because she didn’t get any; her brothers ate them all! I saved some that I’ll take to her today. My hanai mom Ivalee, Pete and I enjoyed so very much the Windward Choral Society’s Christmas concert in Kailua this year. Choral Director Susan McCreary Duprey put together a fine program for her enthusiastic choir. What a lot of good energy. I miss singing in a choir, small choirs, so my vocal coach suggested I join her church choir for Christmas Eve service. She needed a “reading alto.” Okay! That’s me, pick up singer. Tonight’s the night, 7 pm, in Kailua at Christ Church Uniting Disciples and Presbyterians. Right this very minute . . .
A couple of early marriage Christmas memories come to mind as I catch up with the holiday spirit this year—the time when DH and I waited until Christmas Eve to shop and the time I flew from Honolulu to Philadelphia on Christmas Day. The first time, we had a list of loved ones we wanted to give presents to, but we hadn’t planned ahead or gotten anyone’s Santa list. We’d procrastinated, and soon it was Christmas Eve. We headed out to Ala Moana Center, at that time still the largest shopping center in the world, before they were called malls, and when most of the merchants were local. It’s fun to shop with Pete. He will tell you that he can leave me at a certain spot in a store, go away to pick up what he needs, and then come back a half hour later and I will have moved less than ten feet. He always knows he can find me. His style of shopping is like fishing, he says. You poke around, see what you like, hook it, then move on, to the next hole. No dilly dallying. Especially on Christmas Eve! The second memory is about the time when I ran a Hawaiian cooperative from its brick-and-mortar store in rural Hau‘ula on O‘ahu. It was a cute shop that carried Native Hawaiian made products, and the only good gift store for miles. We stayed open on Christmas Eve until 6 p.m. I let the other workers go home, and I took the closing shift. DH and I spent every Christmas in Springfield, Pennsylvania, while his parents were alive, and this time he was already there. I flew out alone on Christmas Day and was among just a handful of passengers on the plane, so cabin service was great. What I remember is arriving at the Philadelphia airport the next morning and being scooped up by Pete, his brother Paul, and their dad—my father-in-law Walter. It was boxing day and we were going straight to Mitchell’s in Delaware. The family was celebrating Christmas “late” this year. Paul had just driven up from North Carolina. Mitchell’s was Dad’s favorite craft store, and everything was on sale. Wrapping paper, suitable gifts, and all-around good buys. I found a shiny eggplant tree ornament. Cool! Mom’s favorite color was purple. Toy trains and cars for Paul’s boys, some things for the girls, brushes and tubes of oil color for me. The others had a field day selecting supplies for whatever craft and woodworking projects they were working on. Heck, everything was on sale, and Delaware had no sales tax! 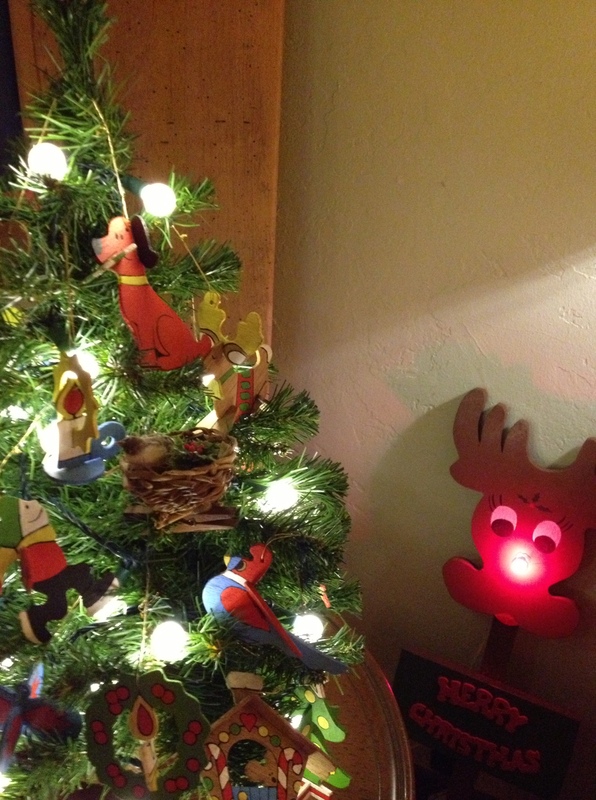 The wooden ornaments for the tree were made by Pete’s parents for their granddaughter Ari. 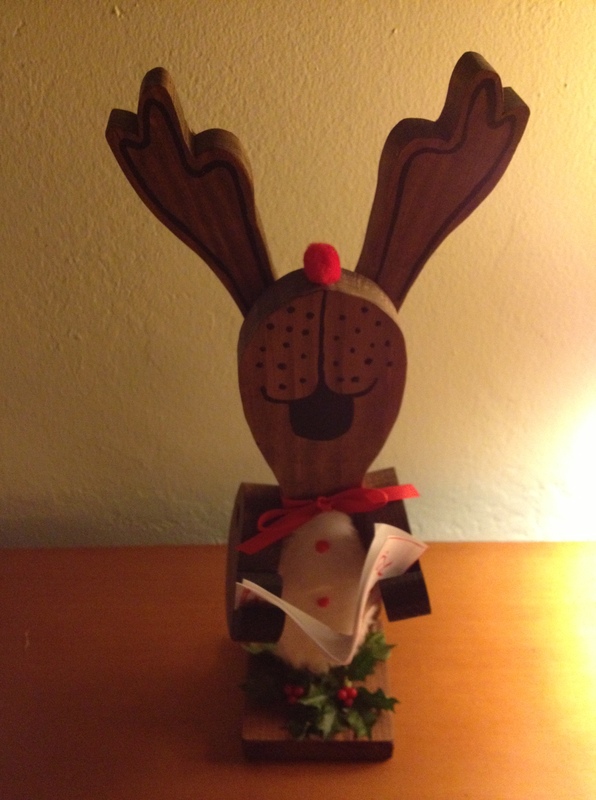 Dad crafted the big Rudolph with the shiny nose, too. Because we arrived early in the morning, we’d beat the crowds. On the way home to where my mother-in-law Dorothy was waiting and where Pete’s sister Penny would be arriving, we probably stopped at the Brandywine River Museum of Art to pick up more presents, and we probably stopped at the Brothers restaurant run by my Italian sister-in-law Patty’s relatives for pizza. There are certain places we always went when touring Pete’s old stomping grounds at Christmastime. Nice, sweet memories, and a reminder that it’s not necessary to plan everything to the last detail during the holidays. Christmas is not just a day on the calendar. Christmas can be every day. I think if I keep open minded to welcome the surprises that are bound to come along this year, it will be enough.